I have been absent from the blogging world for a while but I have kept up with American Idol. Honestly not near as intense as past years but I am up to date. 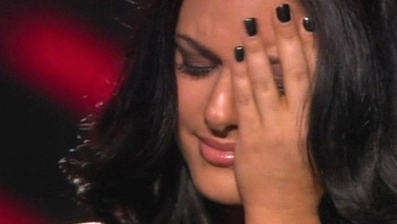 I’m extremely surprise that both bloggers and media journalists are calling Pia Toscano exit “The Most Shocking in Idol History”. I’ve heard people compare her exit to that of Jennifer Hudson’s even. That is an extremely ludicrous comparison. Not only is it extremely ludicrous but it’s an absolutely false statement. I know we as writers love to compare things and I mean anything. Every new singer with soul we want to label them the next Aretha Franklin (I would NEVER!) and any male R&B singer with a smooth voice is the next Luther Vandross. Some talent is just too rare and too great to compare. No, I’m not comparing Jennifer Hudson to that of the legendary status of Luther Vandross or Aretha Franklin but Jennifer sure in hell shouldn’t be in the same talking point as Pia Toscano. The real deal is that Pia Toscano has a strong voice and she can really sing a ballad but she’s boring! Her tone is average and she doesn’t have anything unique about her voice. There are dozens of Pia’s that are on or aspiring to be on broadway. I once made the mistake of comparing her to Streisand but I was saying that to say she’s a ballad singer only. Streisand has a truly great and unique voice, a one of a kind treasure but Pia Toscano is not one of a kind. As one of my friends put it: Who does a Tina Turner song without any dancing, without even a hint of movement? Pia Toscano wanted to prove Randy wrong about her being more than just a ballad singer but what she did was prove him right. Yes, she did sound decent on the song but American Idol is more than voice, it’s about performance. Jennifer Lopez knows that, she’s all performance and no voice. Steven Tyler is both performance and voice. The real deal is that music is more than the voice but it’s about the connection and how you communicate. When you’re on a stage and millions of people are watching you, you must perform! Pia Toscano is no performer. She’s a solid voice and that’s it. Maybe she should consider work as a background vocalist.